This year was the first in which I paid serious attention to garden output, in regard to what we put directly into our freezer, canning jars, and pantry. It was our hope to put up enough fruits and vegetables to avoid most grocery store produce through the winter. However, it wasn’t the easiest year. The local potato crop caught blight, which spread first to our potatoes, then to our tomatoes and late season beans. That said, because we planned ahead and were careful, we did still get quite a few tomatoes (enough for green tomato salsa and pizza sauce). 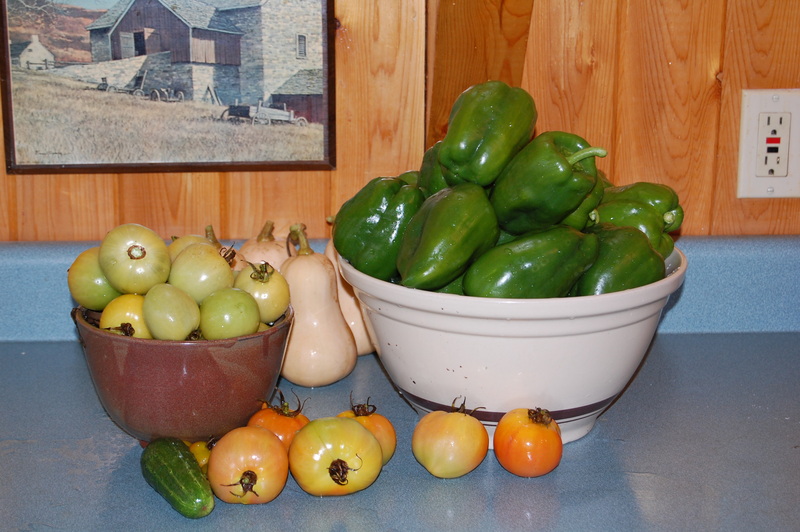 The last of the green tomatoes before they became salsa, green peppers and butternut squash. Pesto Cubes (make pesto, place in ice cube trays, freeze, remove from trays, bag in quart bags). I put up about 2 dozen of these over the summer and continue to grow fresh basil in the house. Spaghetti Squash – 8 med. In reflecting on this, I’m pleased with how much we accomplished even in a rough growing season. This list doesn’t reflect the numerous fresh vegetables we were able to eat over the summer. Next year, we are hoping for better luck with our squash and pumpkins, as I depend on those a lot for baked goods in the winter. We’ve also decided not to plant potatoes and, instead, depend on late season gleaning, as they brought disease into our garden this year. Coming soon… winter recipes for summer’s preserved bounty. After a slow start, the garden is finally starting to take on a life of its own. Though we had some pretty heavy rain during the beginning half of the weekend, it cooled things down and brought out enough sunshine to really make the peppers, tomatoes and cucumbers perk up. I think we’ve finally stopped worrying about them (for the most part). One thing that we’ve really struggled with this year is the amount of rain and lack of early growth (particularly from the cucumbers and peppers). We’ve also been suffering from an infestation of striped cucumber beetles that we’ve been fighting off with a few well placed chickens every evening (though they can only do so much). In preparation for next year, we’ve talked with a local farmer about picking up some aged goat manure to spread on the squash garden this fall (and maybe between the rows in the next week or two) because it isn’t performing to our expectations and we think it might be because the soil needs a bit more “enrichment”. 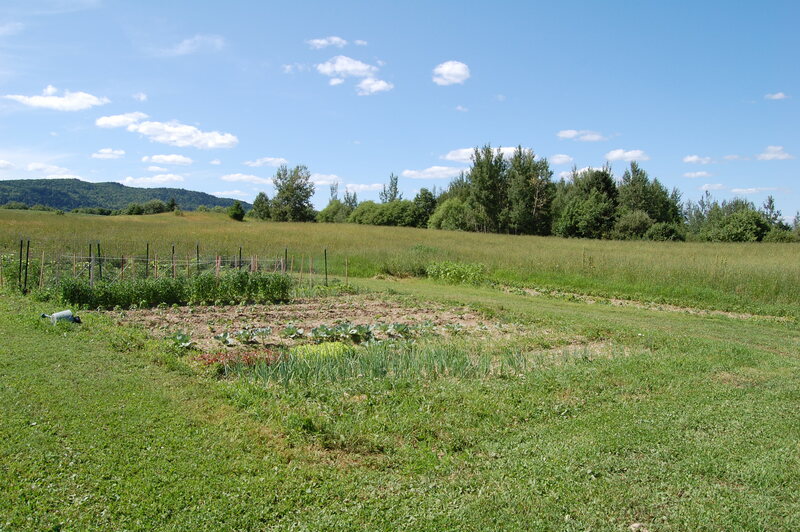 This year, we just turned the soil, dumped in compost and went with it. 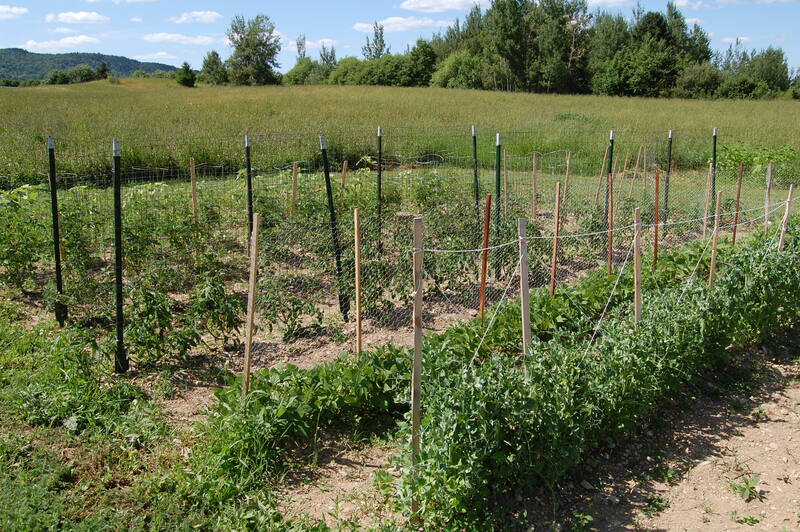 Peas, beans, and four rows of tomatos! What I’m looking forward to most in the upcoming weeks is trying out new recipes for tomato sauce, pizza sauce, salsa and chutney that we can freeze or can and put away for the winter, as one of my primary goals this winter is to try and buy no vegetables at the grocery store – relying instead on home-canned, frozen or root cellared produce that we’ve raised ourselves. Tonight, we’re riding out to J’s father’s house to pick sour cherries from his trees (the same trees that we purchased saplings from earlier this year, when we found them at the local farmer’s market, grafted onto good, hearty root-stock). I’m hoping to freeze, turn into jam, and make (my first) cordial out of the cherries, though having never worked with them before, it might be more of an adventure than I’m anticipating. Check back tomorrow for details, recipes and more!